Balance training consists of strengthening core muscles (abdominals, back extensors, and hip muscles) to improve balance and coordination. Improve your overall quality of life! What exercises help improve balance? 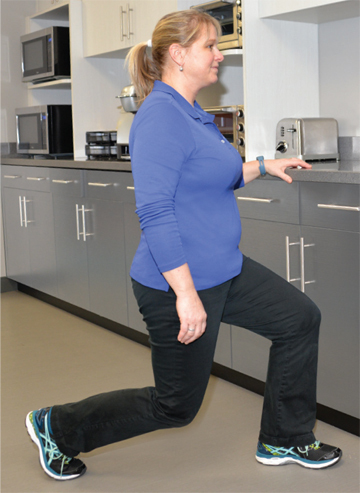 Perform these exercises at the kitchen counter or at a location that has a stable surface to hold. Remember to look out in front of you, not at your feet. Maintain good posture with a strong core. To increase the difficulty, use less assistance from the counter. 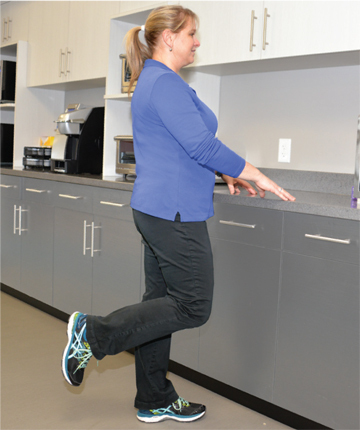 Tandem Standing: Stand heel-to-toe while holding onto the counter. Try to hold the position for at least 30 seconds. Switch feet. Perform 3-5 times on each leg. 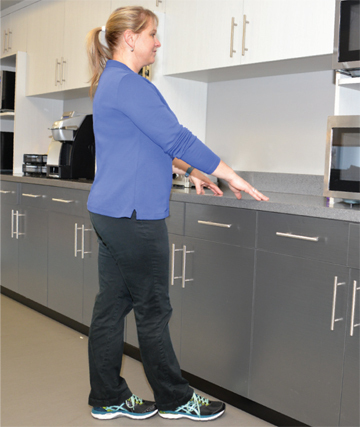 Heel-Toe Walking: Use counter for support while walking heel-to-toe. Use a piece of tape as your line if needed. Perform 5-10 steps. Then turn around and go back 5-10 steps. Repeat 3 times. Marching in Place: Keeping a strong core with stomach tight, raise knee slowly as high as you can, pause, then bring leg down. Repeat with other leg, alternating for 20 repetitions. 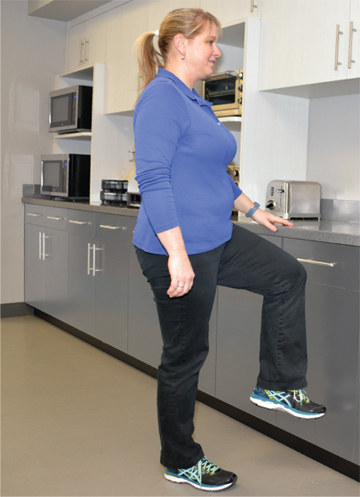 Single Leg Standing: Stand on one leg and try to hold position for at least 30 seconds. Perform 3-5 times on each leg. Static: Staggered stance without moving feet. Dynamic: Stepping in and out of a staggered stance. Be sure to keep your trunk upright and hips forward. Perform 5-10 times on each leg. Self care. Using correct posture and keeping your spine in alignment are the most important things you can do for your back. The lower back (lumbar curve) bears most of your weight, so proper alignment of this section can prevent injury to your vertebrae, discs, and other portions of your spine. If you have back pain, you may need to make adjustments to your daily standing, sitting, and sleeping habits and learn proper ways to lift and bend (see Self Care for Neck & Back Pain). Your workspace may need to be rearranged to keep your spine from slouching. Because extra pounds can make back pain worse, you should maintain a weight that is appropriate for your height and body frame. Exercise. Regular exercise is important to prevent back pain and injury. A program of strengthening, stretching and aerobic exercises will improve your overall fitness level. Research has shown that people who are physically fit are more resistant to back injuries and pain, and recover quicker when they do have injuries, than those who are less physically fit (see Exercise for a Healthy Back). We strive to manage our patients as conservatively as possible. Exercise and physical therapy strengthen back and stomach muscles and prevent pain and injury.